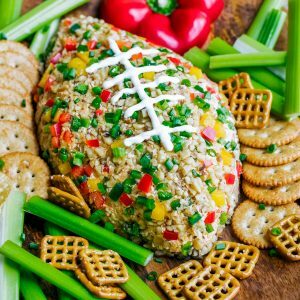 You're guaranteed touchdown status at your next game day party with this Buffalo Ranch Football Cheese Ball! This crazy easy appetizer can be made in advance and is portable and DELICIOUS! Below you'll find detailed instructions to take out any guesswork. This recipe comes together FAST and is super easy to prepare. Add your cream cheese to a large bowl and set aside. Remove seeds + stem from peppers and finely dice. Chop green onion and walnuts. Remove 3 TBSP of your jalapeño, 3 TBSP bell pepper, 2-3 TBSP of green onion, and about 1/4 cup of walnuts and set aside. This will coat the outside of your cheese ball. Add the rest of the veggies/nuts to your cream cheese along with the hot sauce, ranch dip seasoning mix, and cheddar cheese. Mix well using a fork or spatula. You could also use an electric hand mixer if you prefer! Making it spicy? Give the mixture a little taste test on a cracker and add more hot sauce and jalapeño if desired. Try not to eat it all right then and there! Once ready, scoop out mixture with a rubber spatula and add to a sheet of plastic wrap or parchment paper and form into an oval shape. Flatten the top of the oval, pinching the ends and pressing the sides while shaping it into a football. You'll want to press down on the middle and sort of pinch the sides while you press it into an edible football. I promise it's super duper easy, relive those childhood play dough days and have fun with it! Place in fridge for 10-15 minutes to set the football. If mixture appears super soft, allow longer chill time. For the optional (but awesome!) laces: Place a few spoonfuls of sour cream in a quart-sized plastic baggie and press into one corner of the bag. Twist the excess bag to make a faux piping bag and snip the end. Pipe laces by making one long vertical line in along the center of the cheese ball and several short horizontal lines. This takes only seconds to do and looks SO COOL! You can use just one bell pepper (any color) or grab a bag of multicolor peppers. Those super cute sweet mini peppers work great here! Make this crazy flavorful buffalo ranch football cheese ball in advance for your game day spread. It requires zero cooking and tastes fantastic the next day. For a crunchy coating, you can chop up your walnuts and peppers and store them seperatley in airtight containers until just before serving, then press them into the football. Store the chopped peppers in the fridge and the chopped walnuts on your counter, easy peasy! The cheeseball itself can be mixed, formed into a football, and stored in your fridge for up to 4 days.